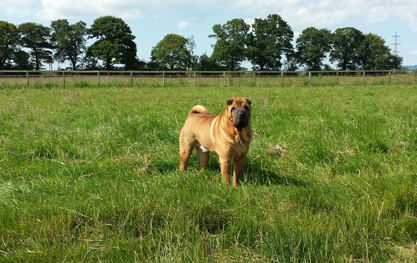 A day in the life of Derrings Kennels, read through a daily care routine. Our day starts early. First walk takes place; this is usually an OFF lead gallop in one of our secure paddocks, ensuring your dog is always safe. 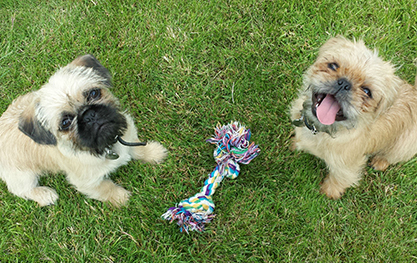 We use our experience and your guidance to decide whether your dog/dogs should be exercised with other dogs. Group walks are far more fun for all. Breakfast takes place. Your dog/s will be fed exactly what he/she has at home (this is very important as dogs do not like sudden changes of diet). Feeding an hour after their walk to prevent any indigestion or bloat. As well as feeding, we vaccuum every kennel, shake beds, clean water is given to every dog and we then have an opportunity to have play time with them in their kennel. From 8:00am to 10am Monday to Saturday, we are open for dogs coming and going. 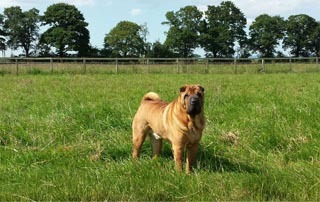 New customers are very welcome to come and view the kennels from Mondays to Saturdays. This is a good time to chat to you and show off our great boarding kennels. Vacated kennels are cleaned and stand empty until our next guest arrives that evening. Other morning opportunities include, brushing and fussing dogs, cleaning walkways, windows, dusting kennels and washing any bedding that has become 'doggie'. Dogs on 3 or 4 walks a day have their lunchtime walk with lunchtime feed if needed. Most dogs at home sleep at this time of the day, so all of the boarding kennel yard is left quiet leaving dogs to snooze, giving us time to catch up with other jobs outside the yard i.e. a spot of gardening etc. We start walking dogs again and changing their waters (dogs love fresh water). Afternoon meal time! Again feeding atleast an hour after their walk. Is the time for afternoon arrivals and departures. Dogs on 4 walks a day get their last walk. We also check everyone else to make sure all is content. Living just 10m from the kennel yard, we are always in earshot. Should there ever be a problem, there is always one of us on hand.